LiveWorkPlay Halloween Family Fun Night takes place October 26, and the re will be lots of changes for this year's event, as well as the December and April versions. First, FFN events have moved to a larger venue at The Good Companions centre, so that everyone can share the experience together in the same room. Second, families can now register online for FFN, and every other LWP event. Be sure to visit the online registration page to sign up! The On Our Own Together Too (OOOT-TOO) housing initiative was launched with a packed Open House on the evening of September 27th. This new transitional housing program is being supported by the Community Foundation of Ottawa for the next three years. The first two participants to experience two months of supported apartment living moved in October 13 and have had a very successful two weeks. They have managed their daily routines and also hosted gatherings for friends and family! OOOT-TOO will provide participants and their family members with an evaluation targeted to meeting their personal housing objectives on the path to the ultimate goal of independent living in the community, now enjoyed by about 25% of SMILE participants. After six straight sold-out years in the penthouse of the Crowne Plaza Hotel, the LiveWorkPlay New Year's Eve party has moved to the ballroom! We're also please to announce that A-Channel Ottawa is returning as our television media sponsor, and we welcome local superstars Sticks 'n Stones as our live musical act for th e night. You have probably seen the band playing Marshy's at Senators home games! There is special earlybird pricing available for members and groups, so get your tickets now and save! Read the Frequently Asked Questions and order tickets: www.NewYearsEveInOttawa.com. LiveWorkPlay's second annual A Good Life family conference takes place on Saturday, November 17. The 2007 theme is "A Good Life Includes Sexuality" and there are separate sessions for parents and participants, as well as lunch and a group wrap-up of the day's events. Another suggested title for the conference was "This is not your Grade 8 health class" because the sessions will target real issues of safety and quality of life that impact daily on people with intellectual disabilities and their families. Please register online, the conference fee is just $20 including lunch and space is limited. 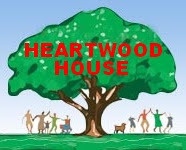 Heartwood House is home to LiveWorkPlay and a community of 15 non-profit organizations working together to better serve their constituents and the community. In addition "The House" also operates the OC Transpo Lost & Found service, which is made possible by many volunteers including several from SMILE at LiveWorkPlay. Twice a year Heartwood House hosts an Unclaimed Items Sale where those items that could not be reunited with their owner are sold to the community. It's like a giant indoor garage sale! The fall version is this Saturday (October 27th) starting at Noon. It's a good idea to get there early. There will be a line but it is well worth it for the hundreds of amazing "priced to sell" items. On September 21, 2007, United Way/Centraide Ottawa announced its largest fundraising goal ever of $29.7 million for the 2007 campaign. LiveWorkPlay is helping out in various ways including participation in the Speaker's Bureau. CEO Keenan Wellar and SMILE self-advocate Jennifer Harris have thus far made 3 visits to local workplaces to share stories about how LiveWorkPlay is making a difference and the importance of United Way support. You can direct all or part of your United Way contribution toLiveWorkPlay. Please click here for a donation form. We hope you have enjoyed this 11th edition of LiveWorkPlayNews 2007. If you have received an email about this blog in error and/or you would prefer not to receive future LiveWorkPlayNews messages, simply click here and follow the simple instructions. That same web page can also be used by newcomers who would like to join LiveWorkPlayNews, so feel free to share the address with friends, colleagues, and family who might like to subscribe. If you have any difficulty with subscribing or unsubscribing, send details to keenan@liveworkplay.ca.